I work for an electrical equipment manufacturer. So, when customers ask for the arc flash characteristics of our medium-voltage switchgear, I scratch my head. Because it doesn’t have any. Specifiers – panelbuilders, contractors, even end-users – often seem to get the arc flash and arc resistant concepts mixed up. It’s time to get things straight. What is internal arc resistance? An internal arc fault is one that occurs inside switchgear. The internal arc resistance of switchgear denotes its ability to withstand arc faults. And, should an arc fault occur, to contain it within a single compartment in the cubicle and divert the hot gases away from personnel. To that end we put switchgear through arc-fault tests. And of course our switchgear complies with international standards – IEC, EEMAC, IEEE, etc. An arc flash is the – often intense – light and heat produced by an arc fault. It happens when two bare live conductors come together and endangers operating and maintenance personnel. Direct exposure to such heat radiation can cause severe burn injuries. – the duration of the fault current flow. We manufacturers have no way of knowing the values of such parameters. Essentially there is no such thing as switchgear arc flash characteristics. Nor do any standards govern arc flashes. Because they are sparked by the way an individual installation is configured and operated, there are just too many variables. Yet some occupational health and safety standards and regulations relate to arc flash. They require arc flash analysis. The best known is in the US – NFPA 70E (drawn up by the National Fire Protection Associations). NFPA 70E requires equipment to be labelled with warnings against arc flash hazards – once it is operating in the field as part of an installation – and flash hazard analyses of installations to be carried out. Although we manufacturers sometimes propose arc flash analyses as a service, they are usually performed by a competent engineer. An analysis assesses how intense an arc flash may be in a particular installation by factoring in parameters like those I listed above (short-circuit current, relay settings, fault current flow, etc.). It also stipulates a flash protection boundary – or approach distance – and what flame-resistant clothing personnel should wear for protection when a flash happens. Those requirements apply to situations where the switchgear cubicle is open. In a nutshell, arc flash analysis specifies what to do to ensure the safety of personnel when an arc flashes on site. Its goal is to prevent damage and injury. Not to prevent the arc fault flash itself. Is the terminology really so confusing? I don’t think so, not really. When it comes to internal arcs, the IEC talks about “arcing due to an internal fault”. EEMAC refers to switchgear that is “internal arc tested” or has an “arc resistant construction”. The IEEE uses the terms “arc-resistant” and “arc-resistant switchgear”. And the IEC “classifies” internal arc resistance while the IEEE “rates” it. There lies the only possible terminological confusion: when NFPA 70E speaks of “arc ratings”, it is to classify how flame proof protective clothing is against exposure to arc flashes. Is terminology an issue for you? 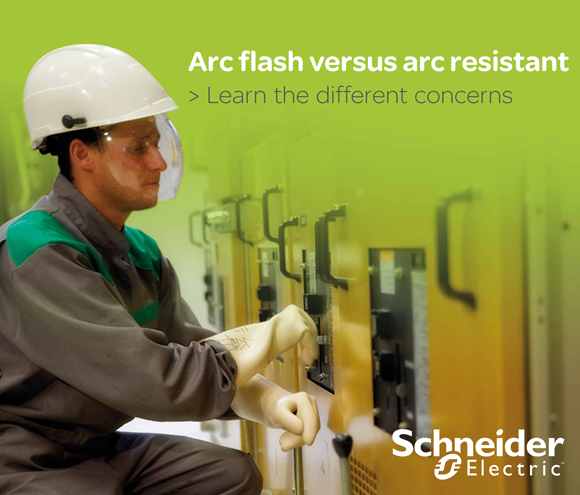 Have you struggled with arc flash and resistance? Please share. Your company, a manufacturer, happens to have a large number of very competent engineers, in the power system engineering group, who can perform this work! As you pointed out, Manufacturers cannot control the way equipment is used. I have seen Maintenance crews work on switchgear WHILE the high voltage Ball Mill was running in order to avoid a shut-down. I have also heard of similar instances where the worker has been killed by an ARC FLASH while working on live switchgear. To those gung-ho people that do not want to stop a piece of equipment for Electrical Maintenance BUT ADVOCATE WORKING ON A LIVE CIRCUIT , I ask, IS IT WORTH THE PRICE OF SOMEONES LIFE ? ?